For over 100 years, De Cecco have been producing top quality pasta, drawn through bronze dies, and crafted with care. 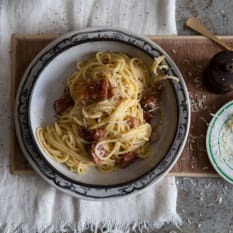 Made to age-old recipes with thoroughly modern techniques, De Cecco pasta is the shot of Italian authenticity that every kitchen needs. View more from Dry Goods, Pasta . Thicker sized spaghetti than one would normally find at the local supermarket. The pasta actually had taste to it. Will definitely buy this product again. Price is not an issue where quality is concerned. As I said before in a previous review, I had to spend my birthday voucher on this and was very sad that I could not buy anything for myself, but after tasting it - wow - I love it and am not sorry or sad anymore. I always buy De Cecco products as they are the best. I have recommended to all my friends and family already.